For places in Iran, see Tomb, Iran. "Tombs" redirects here. 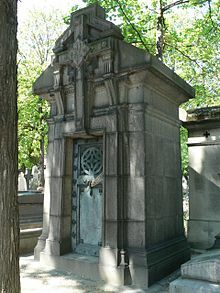 For other uses, see Tombs (disambiguation). "Sepulchre" redirects here. For other uses, see Sepulchre (disambiguation). Church monument – within a church (or a tomb-style chest in a churchyard) may be a place of interment, but this is unusual; it may more commonly stand over the grave or burial vault rather than containing the actual body and therefore is not a tomb. Pillar tomb – a monumental grave. Its central feature is a single, prominent pillar or column, often made of stone. 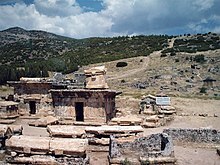 Rock-cut tomb – a form widespread in the ancient world, in which the tomb is not built but carved out of the rock and can be a free-standing building but is more commonly a cave, which may be extensive and may or may not have an elaborate facade. Sarcophagus – a stone container for a body or coffin, often decorated and perhaps part of a monument; it may stand within a religious building or greater tomb or mausoleum. Sepulchre – a cavernous rock-cut space for interment, generally in the Jewish or Christian faiths (cf. Holy Sepulchre). Tumulus – (plural: tumuli) A mound of earth and stones raised over a grave or graves. Tumuli are also known as barrows, burial mounds, Hügelgräber or kurgans', and can be found throughout much of the world. A cairn (a mound of stones built for various purposes), might also be originally a tumulus. A long barrow is a long tumulus, usually for numbers of burials. As indicated, tombs are generally located in or under religious buildings, such as churches, or in cemeteries or churchyards. However, they may also be found in catacombs, on private land or, in the case of early or pre-historic tombs, in what is today open landscape. The Daisen Kofun, the tomb of Emperor Nintoku (the 16th Emperor of Japan), is the largest in the world by area. 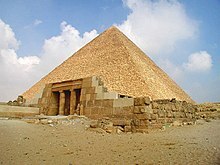 However, the Pyramid of Khufu in Egypt is the largest by volume. The Green Dome of the Mosque of the Prophet in Medina, which is built above the graves of the Prophet Muhammad, Abu Bakr, and Umar. Church of the Holy Sepulchre, which contains the empty tomb of Jesus, where he was supposedly buried and resurrected. 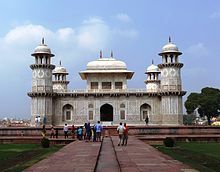 Wikimedia Commons has media related to Tombs. ^ Morana, Martin (2011). Bejn Kliem u Storja (in Maltese). Malta: Books Distributors Limited. p. 211. ISBN 978-99957-0137-6. Archived from the original on 10 October 2016. ^ Merueñas, Mark (4 November 2012). "Where emperors sleep: Japan's keyhole-shaped burial mounds". GMA News Online. Retrieved 11 January 2017. The Nintoku-ryo tumulus is one of almost 50 tumuli collectively known as "Mozu Kofungun" clustered around the city, and covers the largest area of any tomb in the world.